One of the most important characters in the Hulk canon has never appeared in the movies. Jones was in the comics from the beginning; in the comics, Banner ran out onto the testing range for his gamma bomb to save Rick Jones, causing Banner to become irradiated. Jones is Banner's confidant, partner, and sidekick, something the Hulk needs. One thing the Hulk's portrayal in the movies has fallen short of is talking. 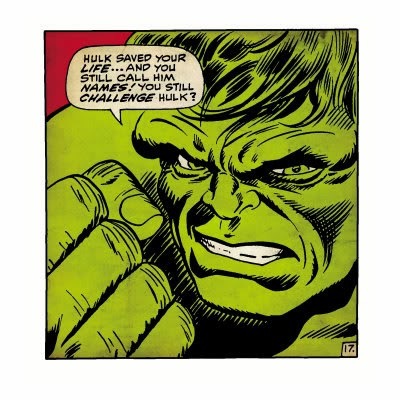 The broken English Hulk uses in the comic, known as Hulk Speak, is legendary ("Hulk smash puny humans"). Yet the movies have never let him say more than five words per film. Having Hulk talk more allows him to become more than just a mindless force of destruction, but an anti-hero we can empathize and root for. Another long-standing character from the Hulk canon, Samson is a psychiatrist who exposes himself to gamma radiation. He transforms into a superstrong but still intelligent Adonis with green hair. I've always liked Samson's complex relationship with Banner; sometimes an enemy, other times a friend. He appeared in a pre-gamma role in The Incredible Hulk, but I'd like to see the next one Hulk him out. Batman has the Joker, Superman has Lex Luthor, and the Hulk has the Leader. He's arguably the Hulk's greatest enemy, yet he hasn't appeared in any of the Hulk movies. Exposure to gamma radiation enhanced the Leader's brain instead of his body. The Leader is as brilliant as the Hulk is strong, and has psychic powers to boot. He's a deadly enemy we need to see on screen. The movies have tended to focus on Bruce Banner, which would make sense, since he has a human face and a human problem. It's also cheap. The problem is the audience doesn't really care about Bruce Banner. We want to see the Hulk. Some recent properties (like Avengers: Earth's Mightiest Heroes) have realized this, and allowed the Hulk to stay that way during almost the whole series. It would be expensive to shoot, but not insurmountable, and the results would be awesome. What would you like to see in the next Hulk movie? What did you like in the previous movies? I tend to think a little Hulk goes a long way, which is probably why it worked in the Avengers, where he wasn't taking up the whole movie. Defiantly need the Leader in a Hulk movie. He might be super strong, but underestimates Hulks power. I never saw any of the hulk movies but they did look like a lot of fun. The Leader may not have appeared in Incredible Hulk, but his alter ego Samuel Sterns did. And the last we saw of him, his cranium was mutating. I think Leader was planned to be the next villain for the Hulk. Ty Burrell will always be awesome. 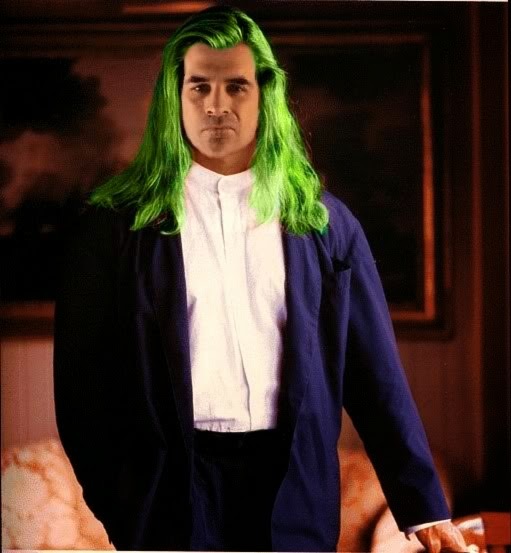 Except with long green hair, apparently. Holy '80s gamma freak, Bruce! I've tended to by far prefer the Bruce Banner scenes in the three movie appearances to date. 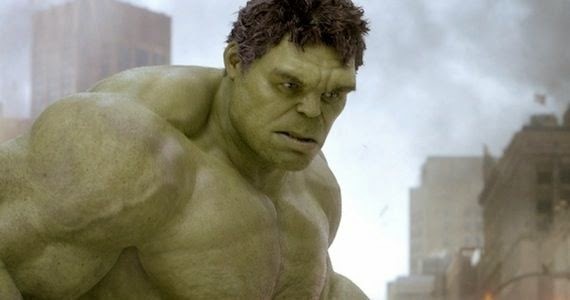 Mindless Hulk smashing was really only amusing in Avengers, but then, the whole character really was a standout throughout that one. As for all these elements from the comics, a lot of them collapse into characters we've already seen, whether love interests or allies or crazy military commanders. I don't know that any of them necessarily add anything to his mythology other than the fact that they've been in it for a while. The Hulk's main appeal is his questionable status. That and the human he otherwise is who still can't quite believe he turns into a giant green monster.